Nine months ago Phil Busuttil and David Thatcher departed UK-based Ninja Theory – of Enslaved and DmC: Devil May Cry fame – to form the two-man indie team TriCat Games. 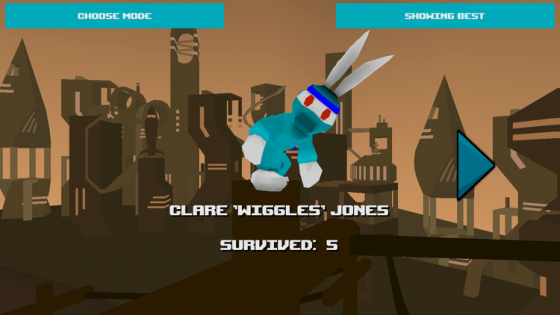 Now that their first game – though not the game they started developing first, but we’ll come to that – R.A.B.B.i.T (Rope Assisted Ballistic Bunny in Transit) is due to be released on iOS imminently, we couldn’t resist a chitchat with TriCat. R.A.B.B.i.T is “an endless grappling-hook game”. Where did the inspiration come from? 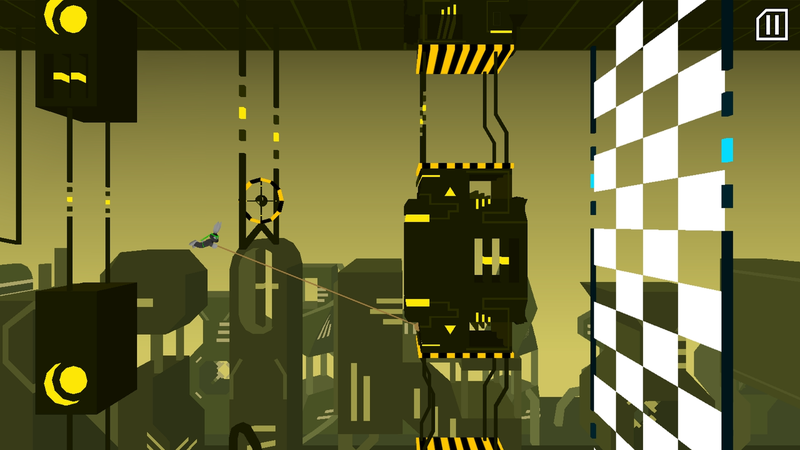 The game is primarily inspired by the ninja rope mechanics from the Worms series, but with a game loop like Flappy Bird and other modern mobile action games. When we sat down to discuss what our second game would be, we went back and forth on a couple of ideas that weren’t really going anywhere. The suggestion of rope-swinging mechanics came out of one of these discussions, and we immediately dropped everything else and decided to see if we could make that work. Regarding the game being endless, this was always going to be the case. Targeting the mobile market, our intention has always been to make short-burst replayable games where the challenge is different every time you play. Grappling-hook mechanics seemed like a natural fit for that style of game, so we just had to work out how our levels were built. How did you flesh the concept out to a full game? The different modes, for example. Initially there wasn’t going to be much more than the core gameplay loop, as the game was meant to be a 6-week project. So, like Flappy Bird, there was a title screen, you started the game, died, and then restarted it. When we decide that we like a mechanic however, we tend to want to polish it to the best of our ability. So we thought about other gameplay modes we could add. These modes mostly came out of how we dealt with level generation. Creating a single, potentially-infinite scrolling level got ruled out quite early on for technical reasons, so the game’s ‘endless’ mode is actually just a series of short levels that you complete in sequence. Once we decided on generating discrete levels with a start and end point, it made sense to have a mode where you could enter you own level seeds (Much like Worms), and also a selection of pre-made levels. At one point we were planning an ‘RPG’ mode, where you gained EXP for completing levels, and lost it when you died, challenging you to play well to maintain your level. When we gave the game to some friends in the pub one Friday night, however, and we watched them fighting over an iPad to play the basic survival mode, we realised that that was compelling enough, so we lost interest in RPG mode. You’ve said that the art side is important. It’s an enjoyably esoteric mix: a hint of Canabalt in the landscapes, a bit of Super Meat Boy in the sudden bloody deaths, and nicely characterised bunnies. How did that come about? The landscape design was something Dave had wanted to do for a while; high-contrast building silhouettes with lots of glowing neon. He’d also played FRACT OSC shortly before we started working on the game, so that was also a contributing factor, and flat-shading everything enabled us to get the game running on low-end devices. When it came to deciding what the character was going to be, our starting point was a Ninja Rabbit, and from there we weighed up the pros and cons of different animals. An octopus came up at some point, but the idea of animating eight limbs was a little off-putting, considering we hadn’t done any character animation before. In the end, we decided to stick with the rabbit, as we could exaggerate the features and give the character a recognisable silhouette, but also because we could make it cute, so that players would care about trying to keep it alive. The bloody deaths mostly came about out of necessity; we tried and failed to get the character to ragdoll, so the easiest way to deal with death was to remove the character and trigger an explosion of blood particles. We wanted the deaths to be a bit shocking, anyway, so this worked well. Those bunnies have very full names – like Major Beverly Connors. Does that sense of humour run through the whole game? Sort of! 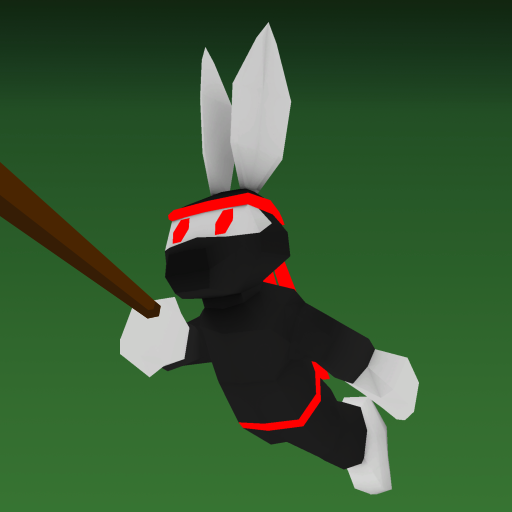 At some point in development, we decided it would be more interesting if instead of the usual video game conceit of a single character dying and coming back to life, each rabbit that you played as was a unique entity. Making a system to alter the colours of the rabbits was the first step, and we also made a system to randomly assign names to them. A lot of the names that this system generates tend to be quite goofy, which is what we were going for with the general characterisation of the rabbits. Their vocalisations are also quite over-the-top, as we got a friend of ours in to record the noises they make when swinging and dying, and some pretty ridiculous sounds came out of that. R.A.B.B.i.T is free to play. Was that an obvious decision, or did you agonise over the business model? Making the game free was an obvious decision for us. With the way the mobile games market is, charging any amount of money for a game drastically reduces the number of people that will play it, and as a new indie studio with no tangible track record we couldn’t afford to take that risk. Our games were always going to be free and advert-supported, and we make every effort to make the adverts as unobtrusive as possible. There was also never any question of doing anything gross with in-app purchases, like energy systems or in-game currency, because we’re strongly opposed to that kind of free-to-play. What we did agonise over a little was whether to allow players to pay to remove adverts, as this would cause the game to show as having in-app purchases. In the end, we decided that the negative connotations this would have for a lot of players wasn’t worth it. It’s fair to say you’ve had a few issues with getting finished games released. What happened with the first game you started developing, Defendy Rocket? It’s on its way! Defendy Rocket is another example of a project that got away from us a little in terms of its scope; it was initially supposed to consist of a short gameplay loop, but as we added more to the game, we noticed that games were becoming longer and longer. Not wanting to change the way we monetised the game, we decided that allowing the player to watch video adverts in exchange for in-game rewards, in the way that Crossy Road and many other games do, was the best way to deal with this and still keep the structure of the game that had emerged, which we liked. The problem then was getting video adverts working in Unreal Engine 4, which has very limited advertising support by default. We were pretty much finished with the game in October last year, but were waiting for an advertising plug-in that supported video ads. Now that we have that, we’re putting the finishing touches to Defendy Rocket, but we chose to release R.A.B.B.i.T. first because it seemed to have a slightly wider appeal. And getting R.A.B.B.i.T out of the door has presented problems too, hasn’t it? What’s the status of the Android version now? Releasing a game has definitely not gone as smoothly as we’d have liked! We were planning on getting R.A.B.B.i.T. released before Christmas, but we ran into issues when two of our beta-testers reported that they were having trouble signing into Google Play on their phones. When we looked into it, we discovered what seemed like quite a prominent crash on a number of Android devices, which we reported to Epic as a bug in UE4. We decided against releasing before Christmas, and since then we’ve been sending them information to help them reproduce the issue. After two months, they now have a device to reproduce the issue on, so we’re hoping it will be fixed soon and we can release the Android version shortly after the iOS version. But now R.A.B.B.i.T is getting released, and just in time for Easter. That was actually your plan all along, wasn’t it? How has indie life suited you? Have the setbacks tested your commitment, or were you expecting that? Honestly, everything that could have gone wrong sort of did go wrong, and it’s been kind of depressing at times. The decision to use UE4 was a pretty easy one, as we both had prior experience with it, but the engine’s mobile support is a relatively new addition, and so has been a little patchy, which is where most of our woes have come from. Without an engine coder, our only recourse when these issues came up was to let Epic know about them, and hope they’d get fixed promptly. Issues aside, it’s definitely been a learning process, and we’ve both learned way more than in any previous role we’ve had. A lot of the work is enjoyable, but when you’re a two-person development team it’s inevitable that you’ll have to deal with a large volume of things that are tedious or frustrating. That said, just having direct control over what we make, with design decisions coming from conversations between the two of us, and not being beholden to any third party, has been very rewarding. So it’s swings and roundabouts! You feel strongly about being very open, and have beta versions available to the public from very early on in a project. What’s the thinking behind that, and has it helped development? Going into indie development, that level of openness was just something we decided we should do, on account of being strong believers in the democratisation of the game development process; now that tools like Unreal Engine are open for anyone to use, anyone who is interested in using them should have access to a wealth of information about what it takes to make games. We wanted to contribute to that. The decision also came from a desire to break away from the PR-massaged world of commercial game development, where everything said in public needs to go through the correct channels. We wanted to just talk about what we’re doing, on our own terms. The downside of this is that writing blogs, posting images, GIFs and videos is time-consuming, and can detract from the process of actually making games. Regarding making R.A.B.B.i.T. an open beta, it was largely a decision we made to invite feedback. However, we also knew that without an existing fan-base we probably wouldn’t attract enough attention to get a useful amount of feedback. The more useful form of feedback-gathering has been just showing the game to people we know, which is a lot easier to do if you can give them a link that lets them download the latest version of the game. Finally, co-branded spin-offs are very popular these days, so which big rabbit property are you going to tie up with first?